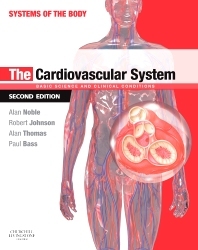 A design specification for the cardiovascular system. Cardiac muscle structure and function. The heart as a pump: valve function and valve disease. Regulation of cardiac function. Blood supply to the heart. Heart failure. The elctrocardiogram. Large blood vessels. Resistance blood vessels.Arterial blood pressure. Capilliary function and lymphatic system. Fetal cardiovascular system and congenital heart disease. Exercise and the cardiovascular system. Haemorrhage and circulatory shoock.